On April 15th 1989 Liverpool FC played an FA Cup Semi-Final fixture against Nottingham Forest at Sheffield Wednesday’s ground, Hillsborough. A disaster occurred at the ground and 96 Liverpool fans were killed. As a Liverpool fan who was 11 years old at the time, I wasn’t at the match, but watched at home on television. To watch your team go down playing football is one thing but to watch your supporters die at the match transcends any sport. It is horrific and Hillsborough is one of the greatest calamities in British history. Today is the twentieth anniversary of the disaster and like many people all over the world I will sadly be commemorating the tragedy. Twenty years on and families of the victims feel that they have not received justice. Justice for the 96 is an organisation at the heart of Liverpool football club. It is something I endorse and fully support. I am a keen fan of Liverpool and have watched many games at stadia all over the world. With my Aston Villa supporting Uncle I was actually in the seated area of the Hillsborough stadium a couple of months before the disaster watching Aston Villa play Sheffield Wednesday. From direct personal experience I can say that it was an eerie place. I didn’t feel safe going to the ground, walking through the streets of Sheffield and inside the stadium it didn’t impress me much, certainly the look of those enclosed terraces to the left of where I sat did scare me. At the time it was standard procedure due to the football violence problems in England, that fenced in pens were set up at football grounds. These pens kept supporters from invading the pitch. They were to tall to climb, especially with the way they angled back into the terraces. As a regular attender of rugby stadia I couldn’t understand why the supporters had to be stopped from going on the pitch. At rugby games the most exciting part of the match as a young fan was when the final whistle blew and you could charge onto the pitch to get your favourite players’ autographs. Football was a more sinister sport. Liverpool had been part of the Heysel Stadium disaster of 1985 where 39 people died, a clear demonstration of how dangerous a sport football can be. At Hillsborough, even though Liverpool had a larger support than Nottingham Forest, they were allocated the smaller end of the stadium. The Leppings Lane end held 14600 in terraces whereas the Spion Kop end had a capacity of 21000. The design of the Leppings Lane end was poor and there had been a number of complaints by many fans about the facilities after they had been injured at previous matches. Liverpool had made an official complaint prior to the semi-final after their supporters were injured during their previous match against Sheffield Wednesday. On the day of the game there were unannounced roadworks on the M62 motorway which meant that many supporters were running late as they travelled over the Pennines from Merseyside. A bottleneck developed outside the stadium as supporters hurried into the pens. Some people who had turned up without tickets on the offchance of getting some at the ground were being turned away but couldn’t exit because of the masses who were trying to get through the turnstiles. The police sensed danger and anticipated that to get all the supporters with tickets inside the ground would take up till 3.40pm, 40 minutes after the scheduled kickoff. It was customary in this situation to delay the start of a match to protect public safety. Chief Superintendent David Duckenfield, the police officer in charge of match security decided not to delay the kickoff and gave an order to open Gate C, where no turnstiles were present. He intended that this would allow people to exit from the crowd of 5000, building to a crush outside the stadium. Ten minutes before the start of the game and the players arrived on the pitch to great crowd cheering. The excited supporters outside the ground used gate C to go into the ground and they began to fill the two central pens via a tunnel. As fans continued to pour into these fatal pens, which had a capacity of only 2000 at maximum, a crush began in the ground. About 3000 people were in the central pens. Those at the front were being crushed into the security gates. The fans at the back had no idea of the problems inside and no stewards were present to warn them off. The match kicked off on time. People began dying as they suffocated in the crush. The tight conditions at Leppings Lane led to many supporters dying standing up of compressive asphyxia. Supporters in the upper tier started lifting fans up from the mayhem below. Fans were attempting to escape the crush by climbing the fences. At 3.06 pm when it was clear that there was a serious incident, the police advised the referee to abandon the game. The images that stick in my mind were of supporters clambering up the security fences in vain. They were designed to prevent supporters from getting onto the pitch and they sure did their job. People were short of breath and sweating. There were no metal cutting facilities at Hillsborough and no way of removing these security fences. A small gate was opened and people began to spill onto the pitch. At this stage, the police feared an incident with the Nottingham Forest supporters so rather than diverting their attention to the dying and injured Liverpool fans they concentrated efforts on creating a police cordon three-quarters the way up the pitch to prevent Liverpool fans from getting to the Spion Kop end. 44 ambulances turned up at the ground but all bar one were refused entry. Advertising boardings were used as stretchers to ferry the casualties. As they tried to get out to the waiting ambulances, police in the cordon forcibly turned them back. 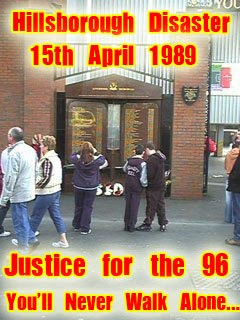 92 Liverpool fans died on the day of the match. Four days later this toll had risen to 95. In 1993, having been in a coma for four years, the life support machine of Tony Bland was switched off, bringing the final death toll to 96. 766 other fans were injured, with 300 needing hospital treatment. The psychological toll was extreme on all present at the match, those affected families, Liverpool supporters worldwide, TV viewers and fans of sport in general, all were devastated by the disaster. It was the worst stadium incident in British history and one of the worst of all time in the world. A government inquiry, headed by Lord Justice Taylor, filed the Taylor Report into the incident. This found that the official cause of the disaster was the failure of police control. An attempt was made to prosecute Chief Superintendent David Duckenfield and another officer on duty, Bernard Murray. Duckenfield initially disguised his decision to open Gate C and stated that it was the Liverpool fans who had forced this gate open when in fact he had given orders to open it. At the trial police officers controversially manipulated evidence. Duckenfield’s doctor declared him medically unfit to stand trial and the prosecution thought it unfair to continue prosecuting Murray alone. Duckenfield took medical retirement on full police pension. Football fans across the world united in their support for devastated Liverpool FC. One of the most poignant moments came in the European Cup semi final on April 19th, the Wednesday after Hillsborough. AC Milan played Real Madrid. Six minutes into the match the referee blew his whistle to stop the game for a minute’s silence. The AC Milan supporters then broke into a rendition of Liverpool club anthem, ‘You’ll Never Walk Alone’. Celtic supporters were also very noticeable in their actions to commemorate the 96. The Liverpool club logo had two flames added either side of the Liverbird as a symbol to the brave dead who perished at Hillsborough. There are many memorials to the 96 dead, including one just adjacent to the Shankly gates at Liverpool’s home, Anfield. Here is the full list of those 96 supporters who died. A further result of the Taylor inquiry was that security barriers were removed at stadia and all-seater grounds became compulsory for top-flight teams. “Some fans beat up PC giving kiss of life”. A quote, attributed to an unnamed policeman, claimed that “a dead girl had been abused” and that Liverpool fans “were openly urinating on us and the bodies of the dead“. These allegations caused the Sun newspaper to be boycotted by newsagents across Merseyside. The Sun’s daily circulation in this area declined by 200000 to just 12000 copies sold a day. The allegations contradicted the reported behaviour of many Liverpool fans, who actively helped the security personnel to stretcher away a large number of victims and gave first aid to many injured. The campaign to boycott the Sun still continues to this day and Liverpool supporters across the world are encourage not to financially support this vile rag, for using our dead as sensationalist material. Don’t Buy the S** is as important an Andield motto as ‘You’ll never walk alone’ or ‘Justice for the 96’. I have sat in pubs at away games and watched an unknowing Liverpool fan stroll into the pub and plonk a copy of the Sun next to his pint. He was almost lynched on the spot. He didn’t realise the significance of his actions. Manchester United and former Evertonian star, Wayne Rooney, caused massive offence on Merseyside when he published his life story exclusively in the Sun. Twenty years on and it seems as though the families of Hillsborough victims will never receive true justice for their dead loved ones. There is a general consensus that they were wronged that fateful day. The finger can squarely be pointed to the authorities’ actions causing the innocent death of many who were just trying to relax and enjoy their Saturday afternoon. Watching a football match is a fun pastime, one enjoyed by normal people across the world. Next time you are sat in a football ground, spare a thought for the 96. They were the same as you or I. They paid the ultimate price for supporting their team and will never be forgotten. I hope and pray you get justice one day. We remember you in our hearts. You will never walk alone…. Cheers for your comment ‘anonymous’. Re Heysel – I know the Liverpool fans were no angels but I blame the UEFA authorities for poorly organising the event in regards to security and staging it in a decrepit stadium. I was disgusted with the organisation for the Istanbul final in the Ataturk stadium and thought that it was another recipe for disaster. Heysel isn’t a proud fact for a Liverpool fan but I think the Juventus fans were not exemplary in their behaviour either. They provoked the incident in the first place.